Chanukah celebrates the Jews’ victory over forces of evil. We celebrate our triumph by kindling the Chanukah menorah. The lighting of the menorah exhibits the true nature of a Jewish victory. The Jewish people do not conquer the world’s negativity through brute force, but by illumination – by brightening the world with the wisdom and guidance of our ancient but relevant Torah and mitzvot. 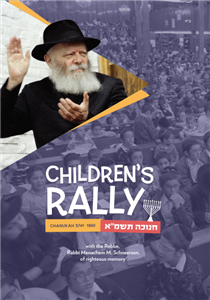 In this children’s address, the Rebbe focuses on the lessons of the Chanukah candles, and reveals the secret of Jewish warfare.